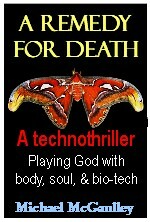 New Google division, along with TIME Magazine, follow trail blazed by technothriller A REMEDY FOR DEATH! "New Google division, along with TIME Magazine, follow trail blazed by technothriller, A REMEDY FOR DEATH"
Really? I have no way of knowing if Googlers or Timers have actually read A REMEDY FOR DEATH, but that does make a good headline . . . and makes the point that it's not just wacko writers of technothrillers who are exploring the possibilities of life extension, anti-aging methods, regenerative medicine, and the implications of a quest for human immortality. The unavoidable question this raises is why a company built on finding information and serving ads next to it is spending untold amounts on a project that flies in the face of the basic fact of the human condition, the existential certainty of aging and death. To which the unavoidable answer is another : Who the hell else is going to do it? Medicine is well on its way to becoming an information science: doctors and researchers are now able to harvest and mine massive quantities of data from patients. And Google is very, very good with large data sets. While the company is holding its cards about Calico close to the vest, expect it to use its core data-handling skills to shed new light on familiar age-related maladies. The article also reminded that. . . It seems Calico will be centered around thet Googleplex in California, a much less secretive and less spooky spot than the remote mountain location in the middle Europe dictatorship where the Hauenfelder Clinic of A REMEDY FOR DEATH is situated. Of course, the Hauenfelder Clinic is fictional, part of a technothriller, but doggone, it does seem that fact is beginning to follow that piece of fiction.